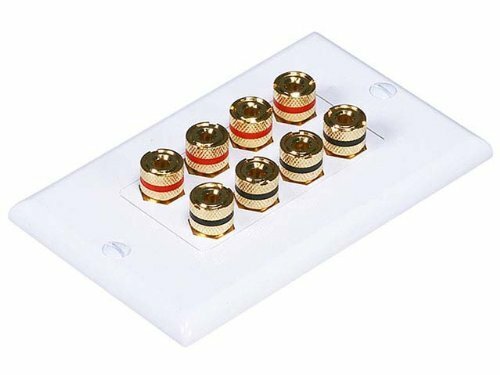 If you are mounting speakers inside a wall, or otherwise running your speaker wires through a wall, you will want to use wall plate to ensure that your connections are neat, clean, and easy to make. This two-piece, single-gang wall plate is designed to distribute speaker level signals to four speakers. 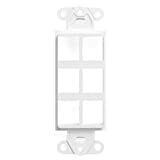 Each side of the wall plate has a universal binding post, which is compatible with bare wire, spades, or banana plugs (banana plugs are highly recommended for best results). The binding posts are gold plated to ensure smooth, corrosion-free connections. The binding posts are 3/4" apart, center to center, and are thus compatible with dual banana plug assemblies. This wall plate requires the use of a gang box mounted inside the wall. Gang boxes are not included and are available separately.